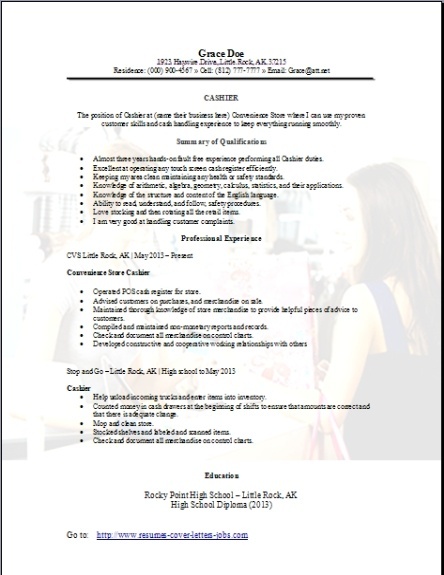 A Convenience Store Cashier Resume will summarize all your acquired professional skills and your experience of handling cash in the service industry. 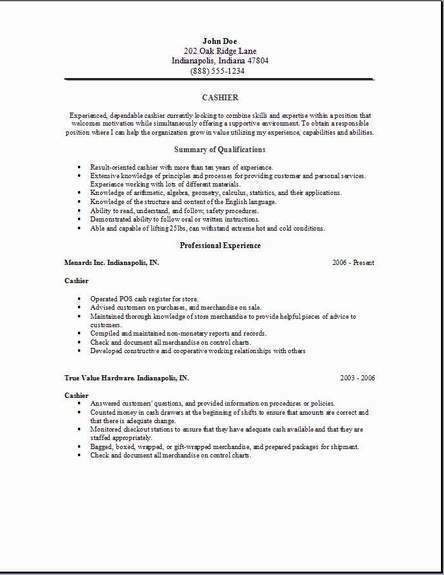 Your resume you create for this convenience store cashier position you are looking for, should at best describe in detail your own past experience and expertise you have in this service industry field, along with a pleasant personality towards the customers, including your very own achievements. In fact for your best shot at getting an interview for this position, you must match the skills that are listed in their company job description, and show that you are very capable of performing all the duties they have listed in their job posting. You need to carefully read the job description, and then create your resume matching as many responsibilities they have listed on their job posting. This will be the biggest, or the number 1 thing you need to take care of on your agenda if you really want to land the job. A convenience store cashier will most generally handle customers that are purchasing goods or possibly services offered by the establishment. They ring up the items that are purchased by the customers using scanners, and cash registers. Accept payments in cash and credit cards from customers giving back change and also receipts. They will also bag the customers’ purchases if needed. They will take care of processing any returns of merchandise, that also includes inspecting the items to make sure they are in good condition and issuing a refund. Answer any of the customers' questions. Helping the customers sign up for any store reward programs. Tally up the money in their cash register before their shift starts and again when their shift ends. The position of Cashier at (name their business here) Convenience Store where I can use my proven customer skills and cash handling experience to keep everything running smoothly. • Almost three years hands-on fault free experience performing all Cashier duties. • Excellent at operating any touch screen cash register efficiently. • Keep my area clean maintaining any health or safety standards. • Love stocking and then rotating all the retail items. • I am very good at handling customer complaints. • Great at adjusting my time so I can perform all responsibilities. • Safety conscious during working hours and in my specific area. • Follow all your rules and all regulations. • Physically fit and lift boxes or product very easily. • Excellent at math and using a scanner. • Very friendly and communicate well with all customers. • I am great at training and catch on quickly, easily get along with my co-workers. • Stocking shelves and make sure all the shelves are restocked. • Maintain the counter tops keeping them clean. • Help customers find what they are shopping for. • Help the customer resolve their complaints. • Assist with cost control and taking inventory. • Help unload incoming trucks and enter items into inventory. • Mop and clean store. • Stocked shelves and labeled and scanned items. • Kept area safe and clean. • I understand many OSHA regulations, and always follow the safest practices while I'm working. • Proficient in many MS programs. • I can learn your POS software very quickly and very confidently. Many convenience store cashier jobs prefer that applicants have at least high school diploma or GED. Cashiers need to have good math skills, since they will need to make sure they are making the right change back to the customer and also count their money from their register at the end of their shift. Cashiers will initially have a very quick training period when hired. An experienced cashier usually trains the beginners. 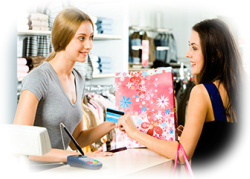 In the larger types of stores, trainees might spend some time in classes to get training, after completion they are then allowed to run the cash register. During their training, a new cashier will learn the store policies and their procedures, and the proper operation of equipment such as scanners and cash registers. Let them know on your convenience store cashier resume you are eager to train and learn everything you can. Look for convenience store cashier jobs at these places near you. Many cashiers start at the federal minimum wage, which is $7.25 an hour. The average hourly wage paid for cashiers in May 2012 was $9.12. So half of all cashiers made more and half made less, so this is the average pay you should be able to make.